Exude nothing but confidence wearing the Marchesa Notte™ 3/4 Sleeve Twofer Dress. Mock neck, chiffon top with vertical stripe detail. Long, bell sleeves with wrist cuffs. Keyhole back with half zip and button closure. 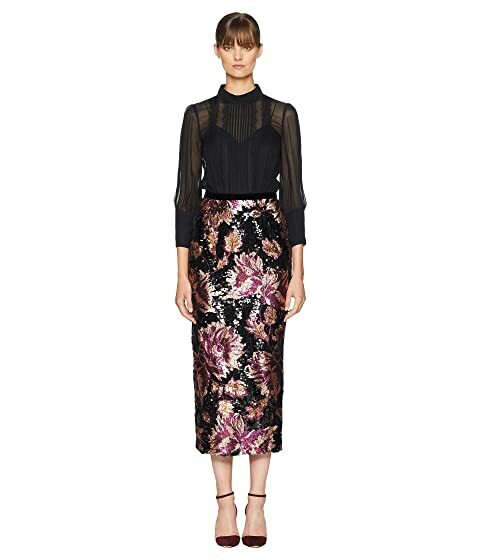 We can't currently find any similar items for the 3/4 Sleeve Twofer Chiffon Blouse w/ Sequin Skirt by Marchesa Notte. Sorry!